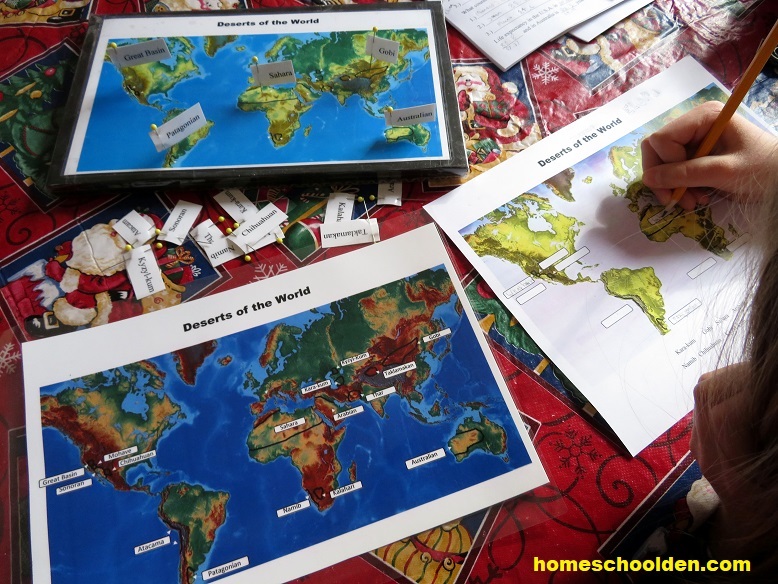 As we start back to school, we are spending some time working on some geography skills again. 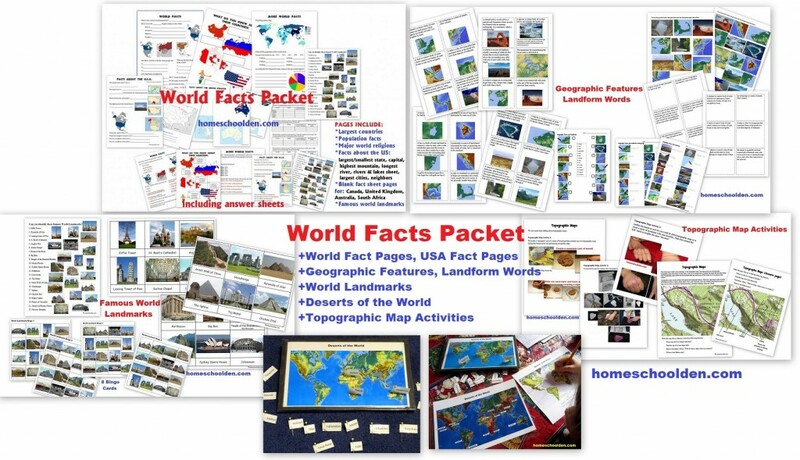 I added an entirely new section into the World Facts Packet about geographic features and landforms (terms such as bay, gulf, sound, atoll, channel, strait, cape, mesa, butte and many more). In addition to working with physical maps, we’ll also do a number of activities about topographic maps. 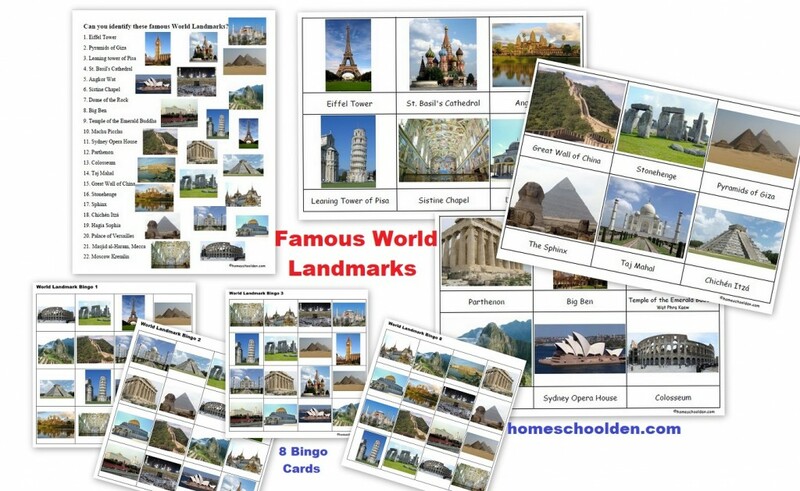 I also added in some fun activities to help learn about famous world landmarks. What are the largest countries? the countries with the largest populations? the largest cities? What is the longest river? tallest mountain? wettest place on earth? the deepest spot? One page that is really intriguing is when the world population reached 1 billion, 2 billion, 3 billion, 4 billion, 5 billion and 6 billion. The answers really shocked me! 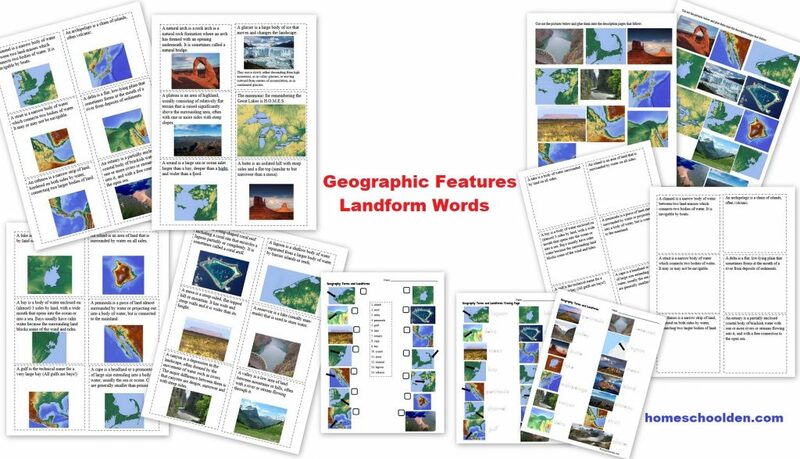 There are some pages that can be used for student research. This section includes Montessori 3-part cards. These can also be used for a memory game. (Place all the cards face-down. Try to find matching pairs with the picture and word cards.) It also includes a matching page. 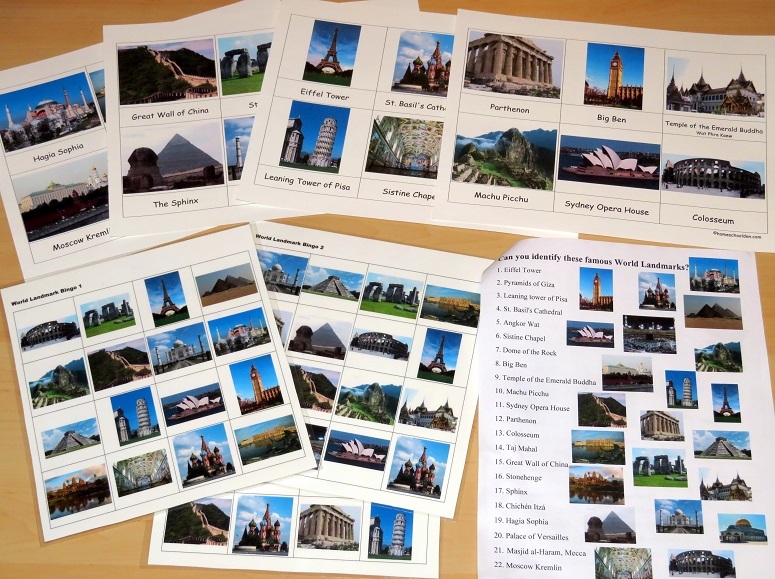 And, it includes 8 world landmark bingo cards (that have just been added to the packet!). 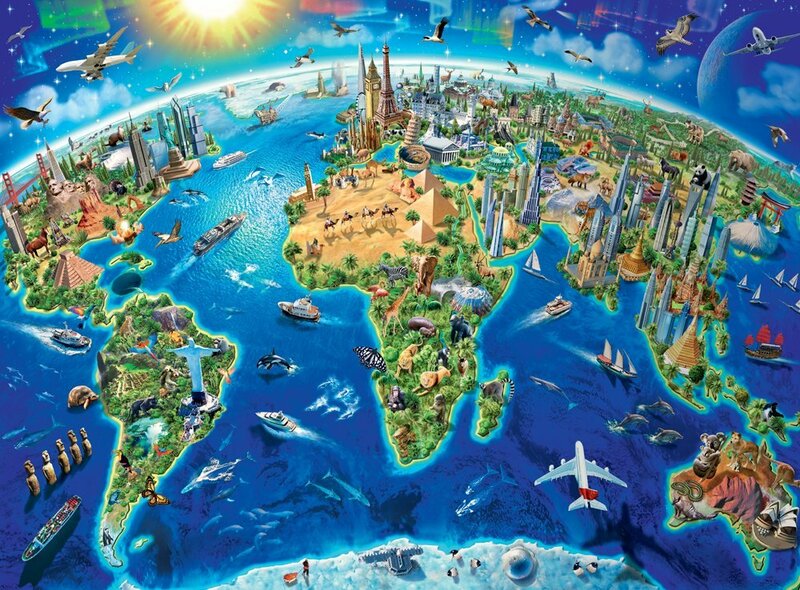 On the first day, we looked over all the world landmarks. The kids looked at their worksheet but did not fill in the answers (they just pointed with their fingers). The second day, we played bingo with the world landmark pictures. (I showed the picture card when they needed help.) On subsequent days we continued to review these (playing the bingo cards), I started to show the pictures less frequently. We laminated the bingo cards and used a dry-erase marker to cross off the pictures as the landmark was called out. 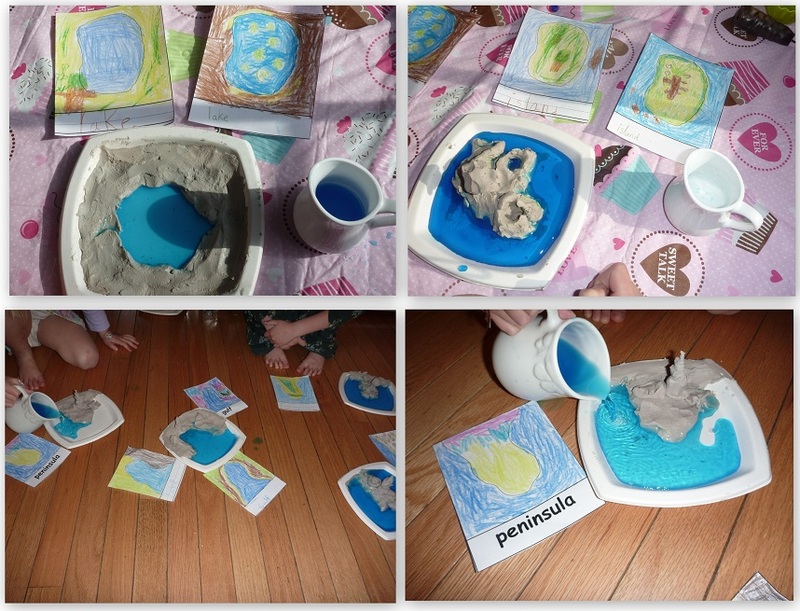 If your kids are younger, they might enjoy creating these landforms with clay. Below you can see some of the features my kids made: a lake, island, bay and peninsula. They really enjoyed that and pouring blue water in when they were done! This time around, my youngest is going to create the landform features with slices of bread laid out on blue paper. We haven’t gotten to that yet, but I’ll add in a photo when she does that! A couple of years ago, when we did our Ocean Unit we spent quite a bit of time learning the location of the world oceans, seas and straits. I wanted to focus on some of the world deserts. We focused on 15: Kara-kum Gobi Sahara Arabian Thar Great Basin Australian Patagonian Namib Chihuahuan and others. There are several pages in this section. 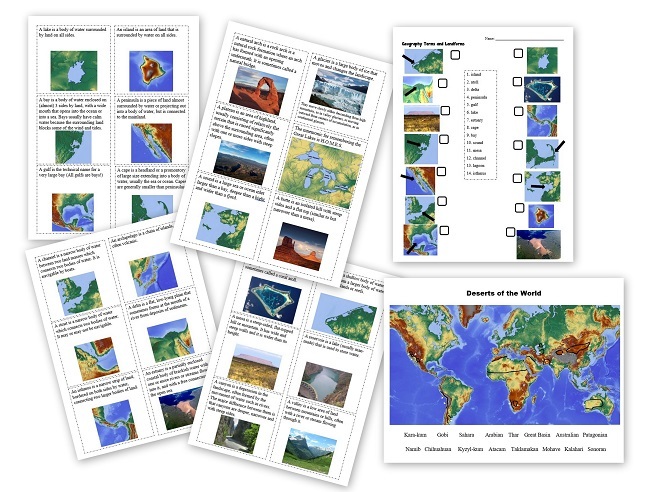 Each day, I had the kids fill in 4 or 5 deserts on their worksheet. In the picture below, we were running out of blue ink for the picture that DD is filling in!) I also made a pin map — and the instructions and printable for that are included in the pin map. The good thing about the pin map is that sometime during the day I would have the kids put in the deserts we had gone over. I could quickly check their work or they could check their answers with the answer page (lower left). We have several activities planned for this part of the unit. I wanted to share the update with you sooner than later, so I’ll probably come back and add in more details in the next couple of weeks. 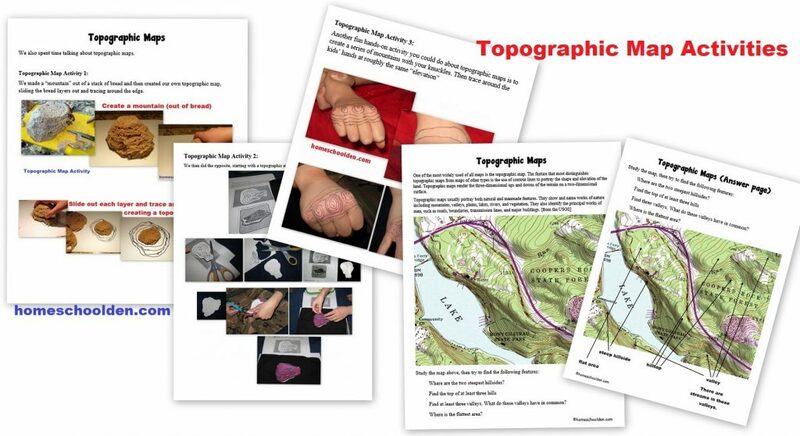 Here are some of the hands-on activities we plan to do so that the kids really understand how contour maps work. 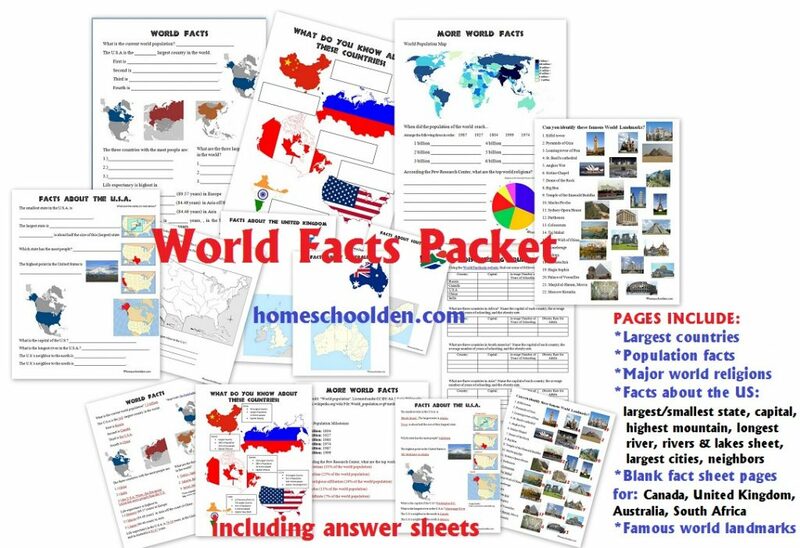 Our World Facts packet is now 70+ pages (including answer pages). This packet is $6.99.